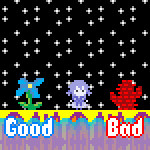 A simple game about watering plants. Click on the pot on the title screen to go to its level, and click anywhere to water. Cute & calming. The pixelation transition started to get a bit hard on the eyes.